This little project has been in the works all summer, and I can't wait to share it with you! This summer, my Mom and I (mainly my MOM!) made a family flag. 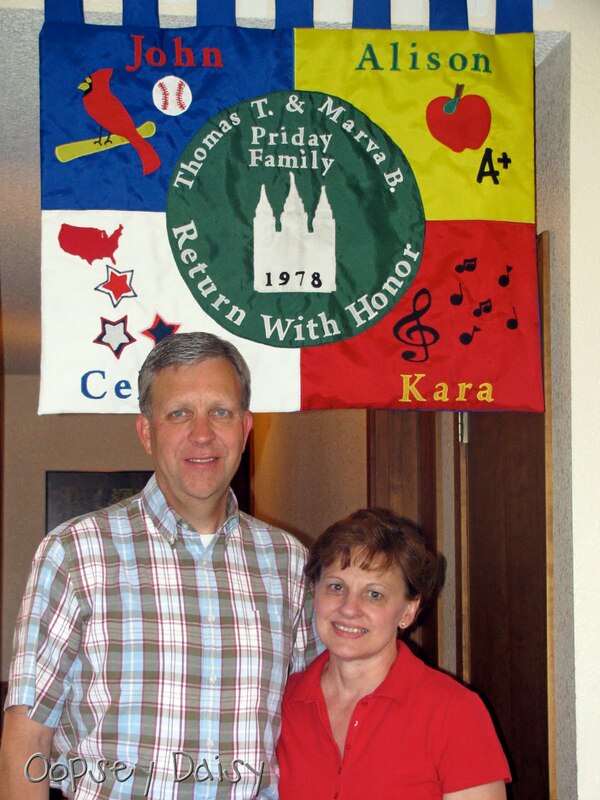 My parents went to a church camp this summer, and they were asked to bring some kind of family banner or flag. For months, we had a vision, and it has been exciting to watch our vision take shape from a sketch on a paper to this lovely flag! At our family reunion last week, we hung our family flag proudly because it represents each member of our family--my parents and their 4 children, including ME! My Mom sewed the flag on nylon so it would be durable outside. 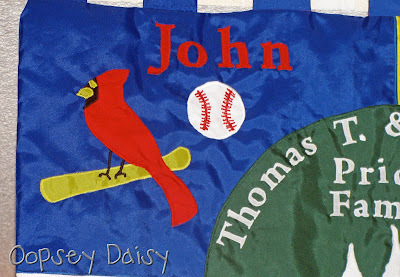 I cut out all of the words and pictures on my Cricut (you can get tips for cutting fabric on your Cricut here), and we appliqued them on. It was a lot of work!! 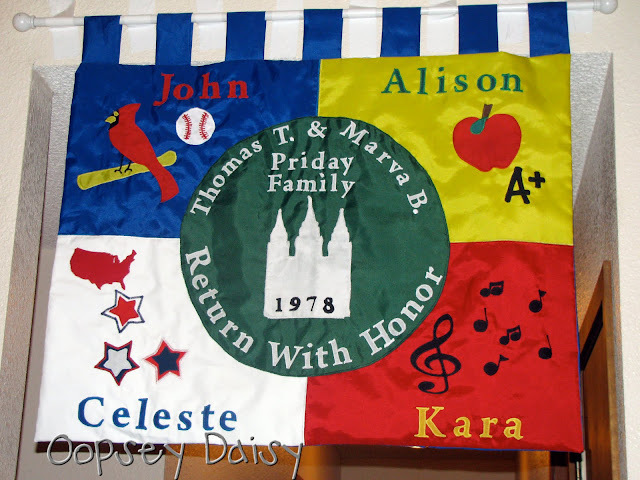 The front of the flag depicts each member of the family, and the back of the flag features an actual photograph of the whole extended family! Each of the 4 kids were able to design their own flag section, a quadrant on the flag. We chose symbols that represented us. The apple and A+ represent me as a teacher. It was interesting to see what each of my siblings chose to portray themselves! My older brother, John, is a huge Cardinals fan because we grew up in St. Louis, Misouri. His section portrays him perfectly! 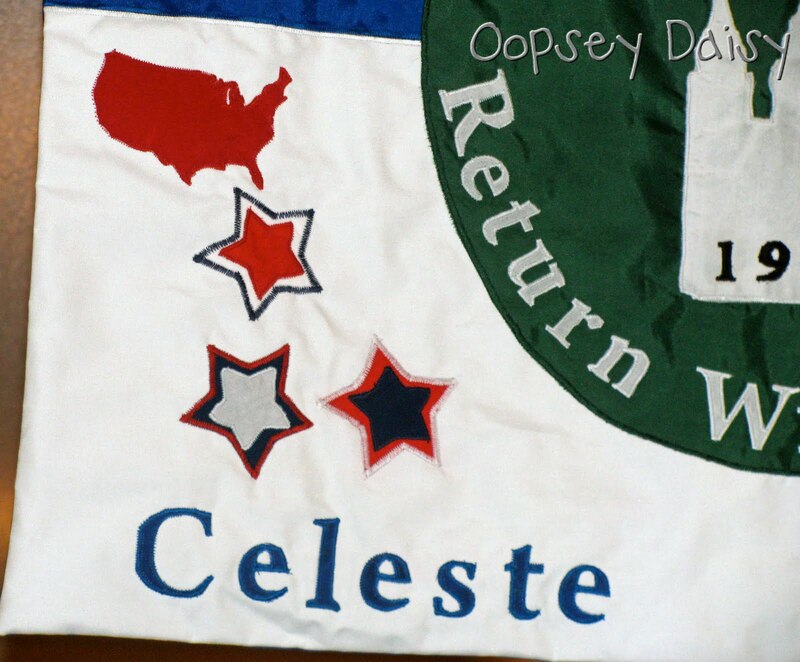 Besides being an American Studies major, my sister Celeste is also our resident politics expert and a true patriot. 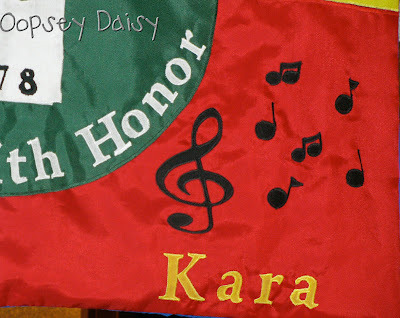 My baby sister, Kara, is the family musician! She sings. She plays the violin. She plays the piano. The girl is a musical genius, so these musical notes and treble clef are very fitting. My parents' symbol forms the center of the flag. They were married in 1978, the founding year of our family. The theme of our family has always been Return With Honor. My Dad always recited that phrase whenever we left the house to go on a date, go out with friends, etc. As teenagers, we used to roll our eyes in embarrassment, but now it is a motivating motto for our family. Look how cute my parents are... My Mom and Dad, the ones who started it all! 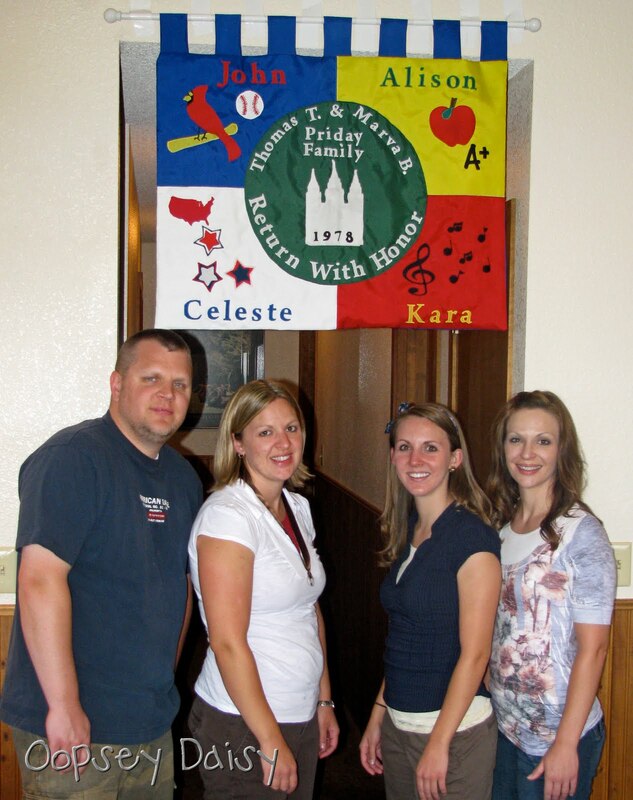 And here are the 4 kids... John, Celeste, Kara, and ME. Isn't that flag a beauty?! 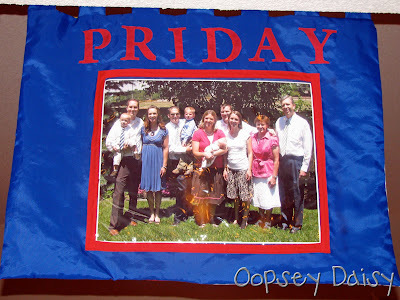 On the back of our flag, my Mom sewed a clear vinyl pocket and slid in a recent family picture. This way, we can update the picture as more grandchildren come along. I feel like I just gave you personal introductions to my entire adorable family! 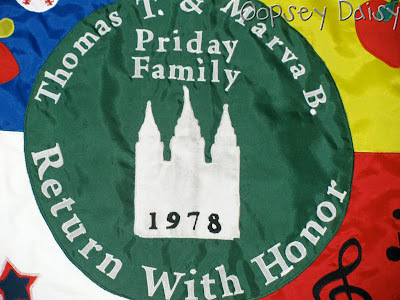 This was such an integral part of our family reunion--a flag we can fly with pride! Very fun idea! 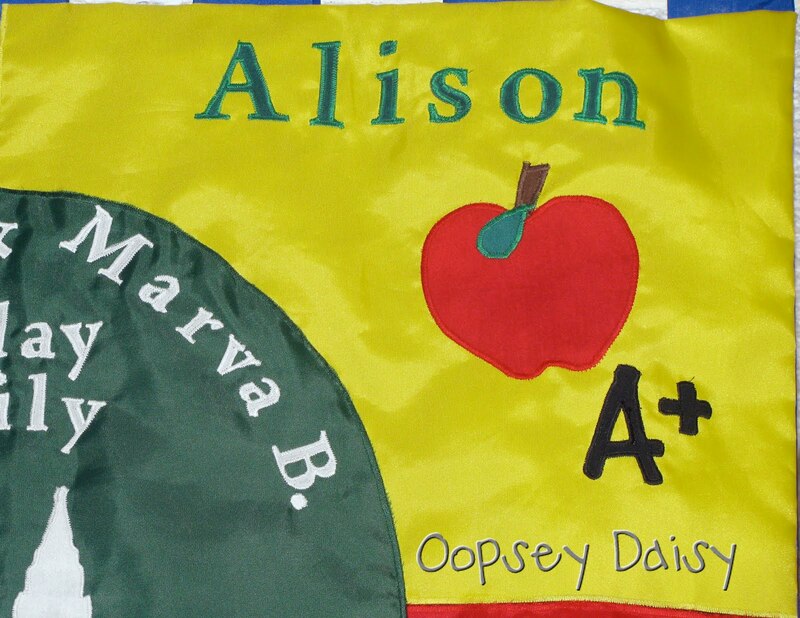 I love that all of the *kids* got to choose what to put on their section of the flag. Your mom did a great job! Love it! All the work that you guys must have put into this…I can't even imagine. What a great thing to show your family "pride"! All I can say is…HOLY COW. What a neat project. 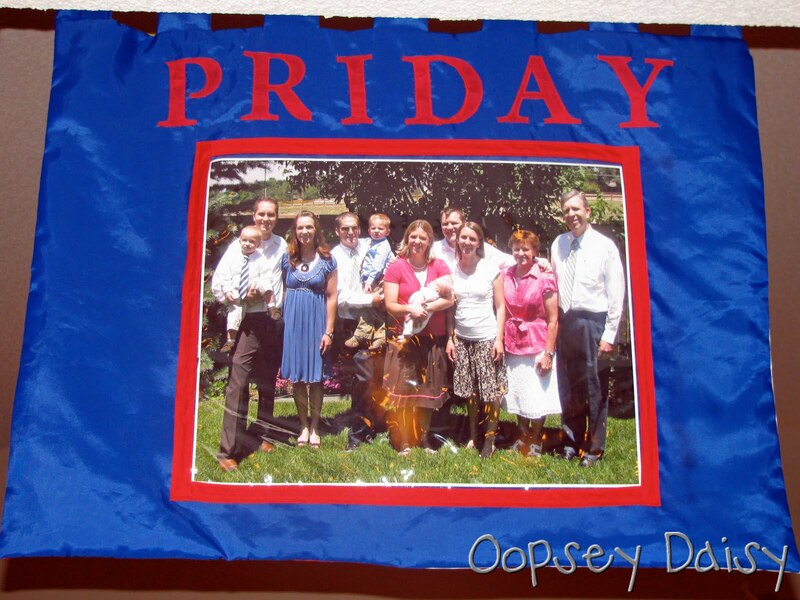 And looking beyond the flag alone, your family sets such a great example of harboring family values/unity! So, so great. What a great idea!! It turned out darling! What a great family keepsake! This family flag was amazing. You guys did a great job putting it together. I like John's face here. Way awesome! I loved it. That is awesome and so pretty! And join us all month long for a celebration of the Family Proclamation! oh my gosh I absolutely love this idea! 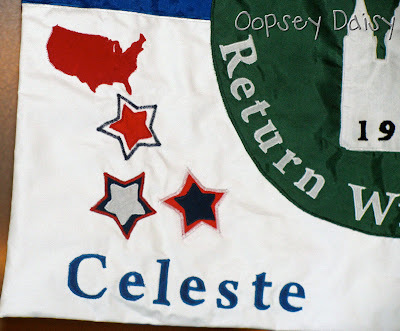 I'm already thinking up the fun ways our family flag could look! First of all I have to say, this family banner is just beautiful. thank you so much for posting it. I needed ideas for a family banner and this is just perfect. It really helped me put together one for my family. There isn’t a whole lot out there on how to do this so I really appreciate it. Thanks for sharing.